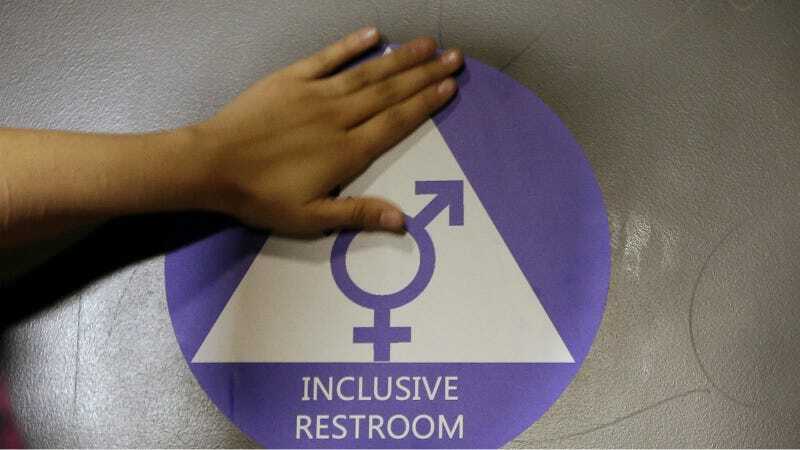 A federal judge in Texas has temporarily blocked the Obama administration’s directive that school districts allow transgender students to use the bathroom corresponding to their gender identity. The directive, which shouldn’t be controversial, is snarled in a messy lawsuit brought by 13 conservative-run states. In May, the White House advised public school districts to let trans students use the restrooms that match their gender identities. Texas and twelve other states immediately sued, claiming not being able to discriminate against trans kids infringes on their rights: Texas, Alabama, Arizona, Georgia, Kentucky, Louisiana, Maine, Mississippi, Oklahoma, Tennessee, Utah, West Virginia and Wisconsin. O’Connor, a George W. Bush appointee, granted that injunction in a ruling Sunday night. Texas Attorney General Ken Paxton is very excited. It’s not clear what trans students are supposed to do while this case is in litigation. Just not exist, we suppose.